Shaver's UTD combines power, flexibility and superior engineering to make post driving quick, easy, accurate and effortless. It's ideal for farmers, fencing contractors, ranchers, rental stores and highway maintenance departments (for guard rails). Because the driver is mounted on the passenger side of the trailer, it's more suitable for meeting DOT standards. Drive a four- to five-inch-diameter post in 10-15 seconds, and save time by carrying up to 15 five-inch posts on the transport caddy. Hitch the UTD to your pickup, SUV or any tow vehicle. No PTOs or tractor/skid-steer hydraulics needed. 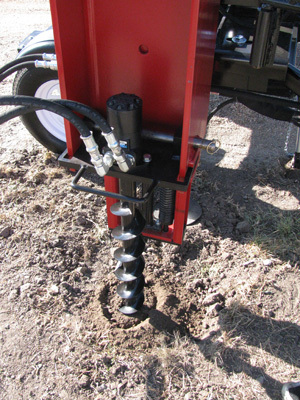 Drive posts up to12-feet long and 10 inches in diameter with inclusion of the pilot auger. Tongue adjusts up to 24 inches. Extend the driver unit's wheel and tilt the driver forward-to-back and side-to-side for accurate post placement in any conditions. Self-contained, 13 CC Honda electric-start engine drives even railroad ties into the ground with ease. Offset joystick lever controls allow the operator to safely stand to the side of the driver unit. A thick rubber safety guard shields the operator arm from debris caused by impact. A standard safety arm securely positions the post in the driving ram. Break up residential concrete with concrete breaker attachment. Clevis or ball hitch provides versatility in transport. Steel T-Post Holder positions steel posts squarely in the driver unit for safe and accurate placement. The optional Shaver Pilot Auger Attachment makes post driving in the toughest soil conditions even easier. The unit's powerful four-inch auger opens a pilot hole before driving the post. This new option reduces wear on the driver and significantly increases productivity by allowing the operator to drive posts more quickly. The unit is especially useful in tough, compacted soil conditions or when driving larger diameter posts (like railroad ties). The specifications for Universal Transport Post Driver (UTD) are subject to change without notice.